An onside kick is a play designed for the kicking team to recover the football, as opposed to kicking it deep, or “away” to the other team. 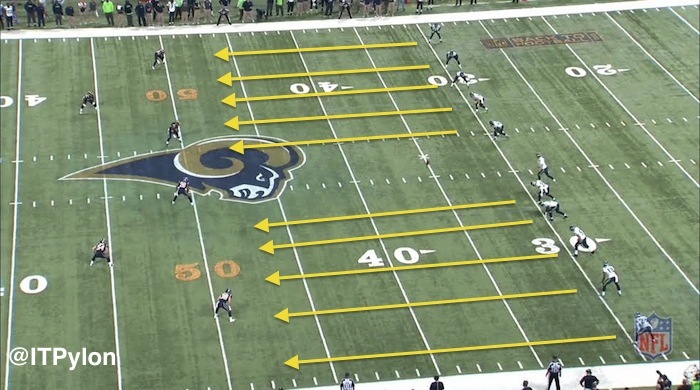 Usually, teams trying to recover an onside kick will line up in 6X4 kickoff alignment. The kicker will attempt to drive the ball into the ground, generating an unpredictable bounce that gives his teammates a chance to recover the ball. 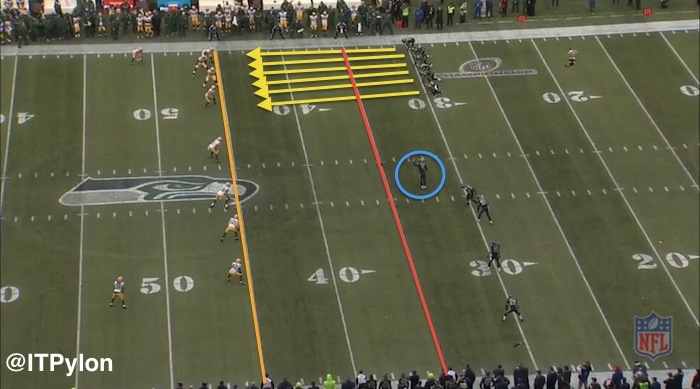 Onside kicks must travel at least ten yards in order to be legal. If the football is touched by a member of the kicking team prior to it traveling ten yards, the result is a five-yard penalty for illegal touching. An onside kick is a desperate attempt to recover a “live ball” that has traveled at least 10 yards from the spot of the kick and/or is touched by an opposing player. The kicker attempts to place the ball as close as possible to his teammates in order to increase the chances of recovery. 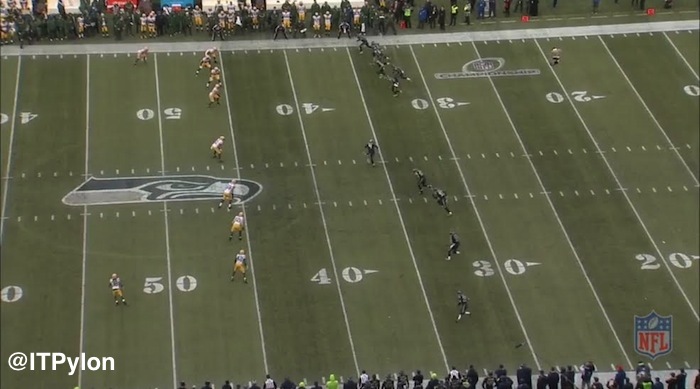 The receiving team just needs to field the ball cleanly and cover up to retain possession. 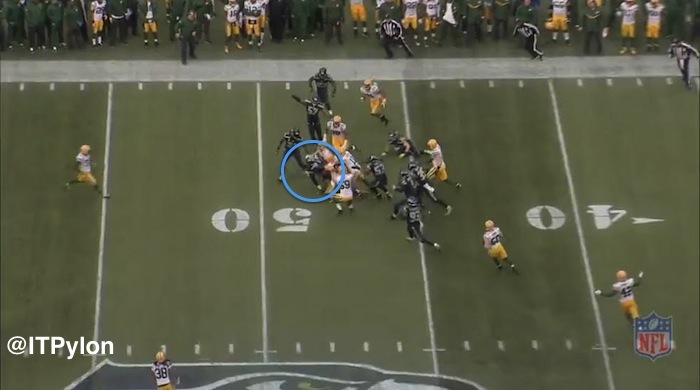 Hauschka strikes the ball, and the six men at the top of the screen are in a full sprint. 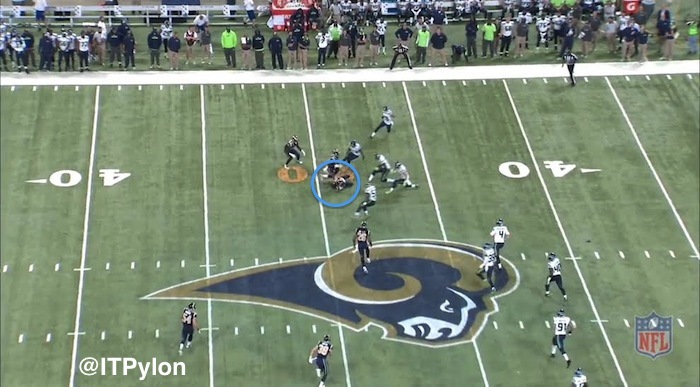 Notice that all six men are still behind the line of scrimmage at the kick, as a player past the line of scrimmage would result in an offsides penalty and negate a recovery by the Seahawks. 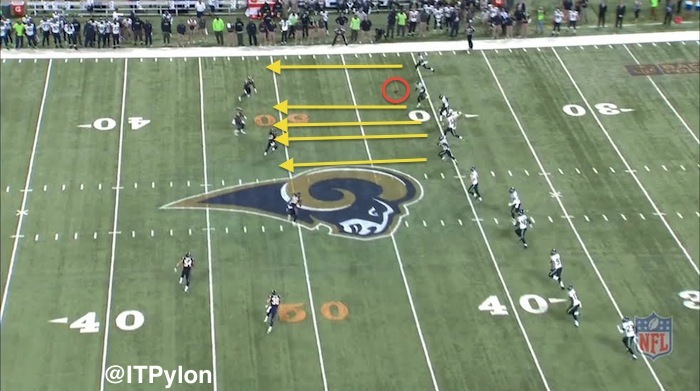 In addition to the traditional onside kick, teams may also try surprise onside kicks which do not openly declare their intentions the way a last-second attempt with 6X4 kickoff alignment. This gives St. Louis a short field to work with, as they ultimately scored a field goal that proved to be the difference in the game.